Born and raised on a farm in rural Herefordshire, Andrew’s family have a strong link with the area’s produce and producers; his father was a shepherd and rare breed beef farmer, his uncle produces Shropshire honey and vegetables, his cousin started and owns Barbourne’s Cider and Perry (One of the UK Slow Food Presidia producers). From this background of producing organic high quality ingredients, Andrew started working at The Riverside Inn, Aymestrey, helping as a kitchen porter 13 years ago. 5/6 years ago he took over as head chef and redirected the restaurant to only source from the best local suppliers, where considerations of traceability, sustainability and seasonality of every dish were key. 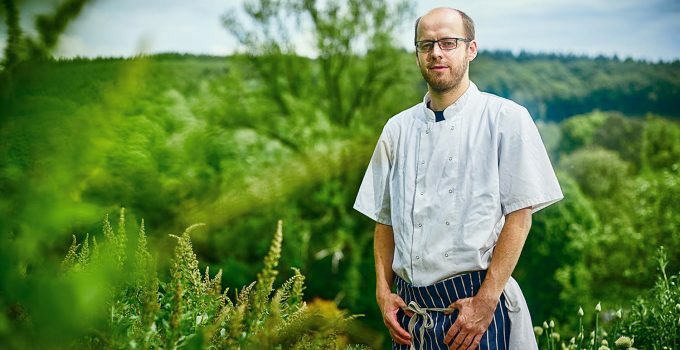 This led him to develop the two acres of land behind the restaurant as a working kitchen garden which is now managed, planted and harvested by the team of chefs, bringing a true “seed to plate” ethos back to the restaurant. Andrew have now taken over as Chef Patron at The Riverside, with the aim over the coming years to push this further, limiting the whole menu to food grown or sourced only within its local catchment area, using the restaurant as a hub to promote the region’s producers.